There are few people that wouldn’t like to have an exoskeleton suit like Iron Man’s. What a lot of people don’t know is that this technology is already with us and will have a bright future. Imagine being able to effortlessly lift huge weights, run tens of kilometres at top speed or climb vertiginous mountains fully loaded with gear without being out of breath. Tasks that previously involved teams of people could now be done by a single individual. All of this can become a reality with exoskeleton suits. Better yet is the fact that with this new technology people who are trapped in the confines of a wheelchair can walk again. This is exoskeleton suit reality. In a case where science fiction inspires reality one of the first mentions of an exoskeleton suit was in 1959. The author was Robert A. Heinlein and the novel was Starship Troopers. In the real-world, exoskeleton suits can chart their origins back to the 1960’s when experimental models were first created. One early device could lift over 300 kilograms (700 lbs) but weighed more than twice that. Nonetheless, its greatest drawback was that its jerky motions would tear a human being apart. For this reason no one ever wore the suit and it was operated remotely. Further development of exoskeleton suits occurred in the late 1980’s spurred on by Monty Reed. A former U.S. army ranger, Reed was paralysed in a parachute accident and decided to make an exoskeleton suit. Though he would later regain most of his motor functions Reed created a compressed air-driven pneumatic exoskeleton suit dubbed LIFESUIT. With advances in computer chip technology and the miniaturisation that is continuing apace there are plenty of companies currently working on exoskeleton suits. In the last six years a plethora of different exoskeleton suits have been created – some of which are currently available for purchase. Three of the most famous exoskelton suits include the HULC (Human Universal Load Carrier) from Lockheed Martin, the tethered XOS Exoskeleton from Raytheon and HAL (Hybrid Assistive Limb) from the Japanese Cyberdyne corporation. Such diversity and competition is sure to offer alternatives and speed up the rate of growth in this burgeoning industry. 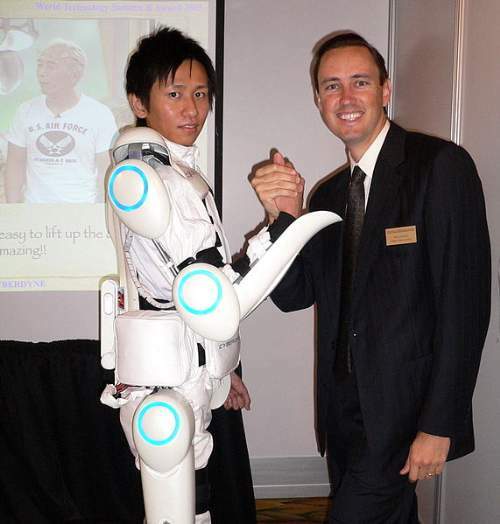 The benefits of exoskeleton suits are numerous and varied. You could accomplish super-human feats with little to no effort. The physically disabled could regain their independence once again and do what the rest of us take for granted. Workloads would become greatly reduced, something that would provide immense benefit to medical professionals. Often several people are required to lift heavy patients placing a huge burden on very limited resources. In terms of healthcare and rehabilitation in particular, exoskeleton suits would be invaluable in restoring people’s motor functions. What’s more exoskeletons would also offer a more manageable bridge between wearable robotics and fully functionally autonomous robots which could greatly improve people’s lives. It seems that Iron Man’s famous suit may not just be confined to the silver screen after all. You may wish to read Exoskeleton Suit Problems That Need To Be Overcome and Exoskeleton Suit Impact: What It Will Mean For Our Future and Exoskeleton Suit Benefits: Enabling The Disabled And Able-Bodied.